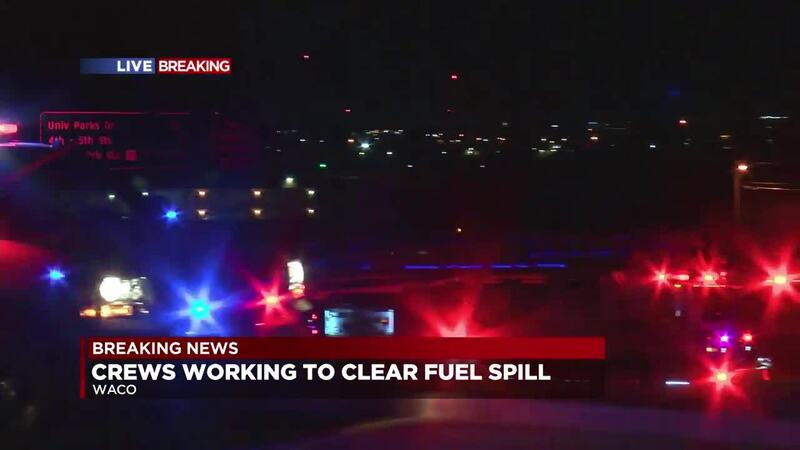 WACO, TX — The Waco Fire Department is responding to a large fuel spill. According to Waco fire, the spill is on northbound I-35 near McLane Stadium. Units responded at approximately 8:55 p.m. Officials said a semi-truck was driving northbound on I-35 when it hit debris. The debris punctured the diesel gas tank and it was leaking for approximately 100 feet. Units are operating at the large fuel spill on the roadway. Traffic has been reduced to one lane. Officials are not sure when the scene will be cleared. Waco fire said to use caution. Waco fire, the HAZMAT team and Waco police were on the scene. HAZMAT SITUATION-Northbound N. IH 35 near McLane Stadium - Units operating at large fuel spill on the roadway.Traffic reduced to one lane. Use caution.